Ever heard the expression "the elephant in the room"? Not sure if it's used much outside these here United States, but it basically means an obvious problem that people are uncomfortable discussing for various reasons, including a desire to avoid making problems for the group. A problem for scientists as well as us reg'lar folk is the definition of species. It's a common term and convenient, and people can use it to sound all sciencey and stuff. Carl (also, Carolus) Linnaeus was the creationist who is called the "father of modern taxonomy", and originated the concept. It's had problems ever since, as the classification system becomes increasingly difficult. Can two critters reproduce? Maybe, but they're on different continents. Similar characteristics? Not so fast, Freddy, lots of things have similarities but are unrelated in other ways. Scientists dispute whether or not to classify certain organisms as different species. The biblical term kind works, but people want smaller details, and secularists prefer the more difficult man-made term. Can't get the Creator any credit, because evolution, right? When you think of the largest land animals on earth today, what comes to mind? Most people would probably say those creatures with long trunks and sharp ivory tusks. But do you mean the floppy-eared elephants of Africa or their small-eared cousins in Asia? 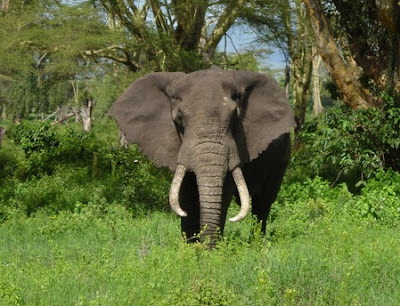 To finish reading, click on "Defining Species—An Elephant-Sized Problem". Also, you may be interested in a more recent post here, "Bears, Hybrids, and Evolution".